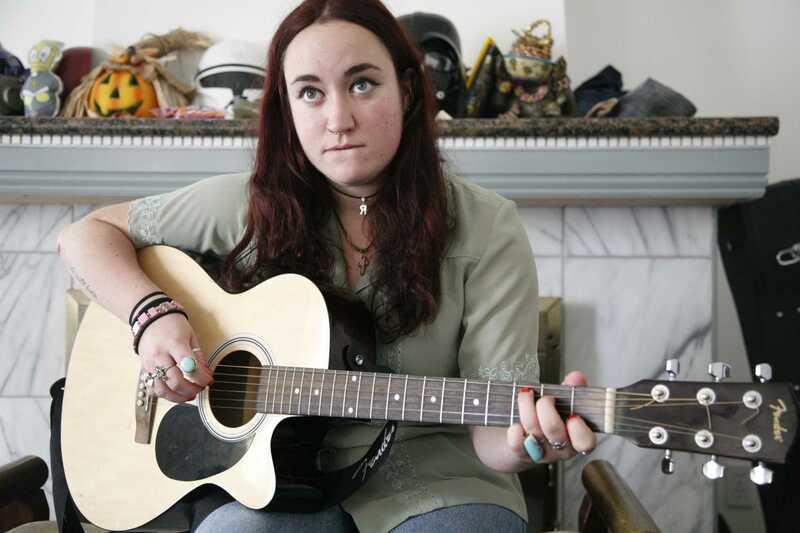 The sound of a Fender electric guitar filled the room and a sweet melody soon followed as Rowie Walsh and Fin May of the blues-folk band Palladino jammed out to their song “Time” in their Sunset District apartment on a quiet Saturday afternoon. The two are originally from Norwich, England, where they formed their band in October 2013. Now, more than a year later, the two study at SF State and have performed on the same stage as Elvis Costello, an iconic singer-songwriter from London. Walsh and May have been a duo since the two performed in a jazz band and found common ground in their similar musical style. “Fin messaged me and said, ‘Hey do you want to join my band?’ and that’s what inspired me to play music,” Walsh said. Walsh, who studies literature, mainly acts as the vocalist for the band but also plays her acoustic guitar, which she calls “Bunny.” The singer said she always knew she had a singing voice. After realizing she didn’t want to be a solo artist, Walsh saw the invitation to join May’s band as an opportunity to grow as a musician. May, who studies history and politics, first started playing nine years ago when he had a music test at school. He initially chose to learn how to play the bass but thought it was too dull and switched over to electric guitar after his first year. May now performs on his black and white Fender electric guitar and writes his own music alongside his bandmate and best friend, Walsh. Being a massive fan of John Mayer, May drew inspiration for the band’s name from Mayer’s electric guitarist Pino Palladino. Fintan May of Palladino tunes his guitar for an improptu performance in his sunset home Saturday Dec. 6. SF State neuroscience student Jackson Kilsby said he enjoys listening to Palladino’s music because of the group’s unique sound, which he described as lyrically soul-hitting with threads of classic blues undertones. “The sounds are magnetic and draw the listener in with fantastic vocals and electric solos, sending the message home,” Kilsby said. 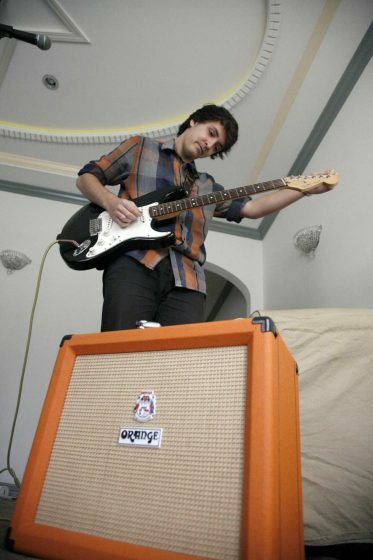 Kilsby is friends with both band members and has been to almost every show Palladino has played in San Francisco. He said he believes their best performance was at the Brick & Mortar Music Hall in November. “I liked it because it was the first time they’ve played a gig at a club and rocked the socks out of the place,” Kilsby said. Back in England, Palladino performed in a talent show to a crowd of 400 people in March. Although they didn’t take home the grand prize, they considered it to be one of their most memorable moments because Costello once played on the same stage. “Basically we shared a stage with Elvis Costello,” Walsh joked. Neither bandmate is searching for fame and fortune but they both agree that they would like to make enough money to avoid getting a “real job,” they said. “Enough money to not have to do anything else would just be great,” Walsh said. Although May enjoys playing alone, he said it could not compare with the experience of playing with his best friend and housemate. The two look forward to growing as a group and to continue playing shows in San Francisco. “It’s nice to have someone to experience everything with,” May said.